← What a difference a week makes! As a child, my favorite movie was Muppets Take Manhattan. On occasion a song from the movie will pop into my head and hang around for a while—that’s what happens when you watch the same movie every day for an entire summer, even if you’re only two, but we’ll get back to that later. This past weekend was an unexpected treat for Blake and me. My older sister, Jaimie, invited us to spend the weekend in the mountains with her family. It was kind of a last minute thing and it was truly a miracle that Blake and I were free this weekend. It’s one of the few weekends this summer that hadn’t been filled with something. I found out on Friday morning that my parents and younger siblings would also be there. Thirteen people in the same house for a weekend definitely sounded like an” adventure,” but it turned out to be more of a blessing than an adventure. Saying goodbye is a process not much unlike grieving. I’ve told myself, and many others, that leaving our families isn’t a big deal. Denial. I’ve been in that stage for over a year now. We feel very called to go and serve in Chile and there is great comfort in that call, but at the same time there is sacrifice in that call. Accepting or admitting that leaving our families is a sacrifice has made spending time with them a lot more special than it was when I was telling myself that leaving really wasn’t a big deal. Our visit this weekend wasn’t the last time we’ll be with my family before we go, but it’s definitely among the last few times. Keeping our upcoming separation in the back of my mind really helps me to appreciate the here and now and here is a little of what I appreciated about our weekend… The relative calm—I’m not sure if the mountains just relaxes everyone or if being in a different un-home place makes people behave differently, but our weekend was very relaxing. Blake even had time by himself to read and be an introvert. With my big family, that is no small miracle… Time to enjoy our niece and nephew—watching their excited faces as they caught fish at the pond is something I won’t soon forget. 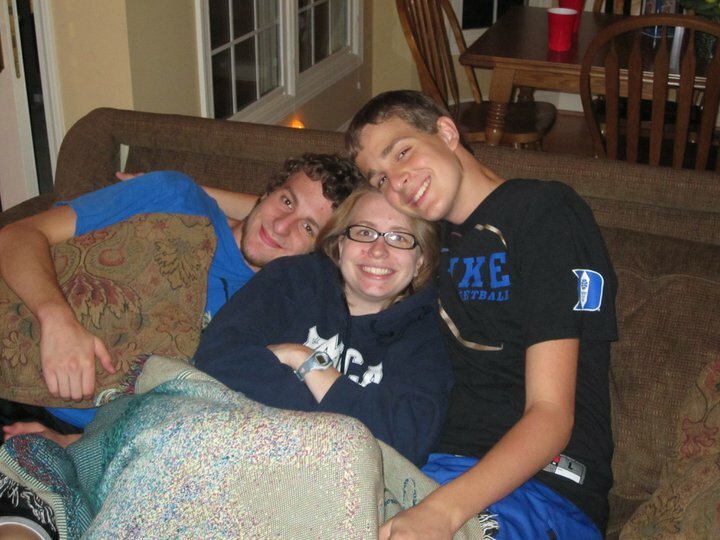 Even more unforgettable were the million hugs and kisses they constantly showered us with over the course of the weekend… Snuggling with my younger brothers. I love that my teenage brothers aren’t too cool to snuggle or give hugs or kiss me on the top of my head just because they’re tall enough to do so… A long walk with my mother and sister. My mom and older sister have always been who I turn to for advice, comfort, and to share in my joy. I’m grateful that the wonders of technology will keep us in touch once I’m gone… A nice long drive on the parkway with a stop at a beautiful overlook. Enjoying the beauty of the Appalachian Mountains was a special treat since Blake and I both feel that a part of us will always be there. Even cooler, though, was the misty, foggy weather God sent to us this weekend. It reminded us of the Andes in Ecuador—another place we both feel at home. Me with my younger brothers, Jonathan and Joey. Those are just a few of the moments I carry with me on my way back to Atlanta. There are others, to be sure, but those stick out right now. I hope I’m able to hold onto those moments as we continue our transition. Our life has been so chaotic lately that it was a real blessing to be able to literally “go up on the mountain” and recharge our batteries while being loved on by my crazy, yet amazing, family. Here’s the song that kept playing in my head. I couldn’t make myself sing it out loud. I guess that would make it one step closer to being real and, while I know I’m not ready to sing it, I can at least type it. I’m sure there are more appropriate songs out there for what I’m feeling, but this one is so natural and familiar. Thanks, Muppets. Love this! I’m so happy/surprised you had a quiet weekend with your fam 🙂 What lovely memories to hold onto when you are missing them in your new home.